When your home or business suffers from water or fire damage, many restoration companies only mitigate the damage rather than completely reconstructing damaged property. 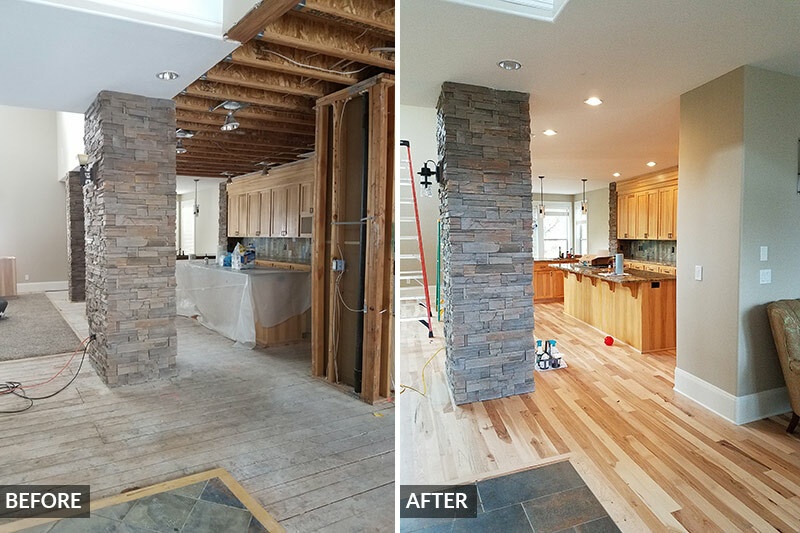 We take it a step further at ServiceMaster Recovery Specialists – as a fully certified general contractor, we proudly serve Bend with any construction service, from kitchen remodeling to home reconstruction after a fire. Since 1993, we have been going the extra mile with restoration services in Central Oregon – our highly experienced technicians can complete any job from start to finish, regardless of the amount of damage on your property. Our employees are tradespeople who specialize in carpentry, structural repair, remodeling and contracting, and they are required to go through continuing education to stay at the forefront of the restoration industry. Indeed, you can expect nothing but industry-leading service when you work with ServiceMaster Recovery Specialists to rebuild, remodel and restore your property. Flooring installation and repair – carpet, tile, hardwood, vinyl, laminate, etc. Whether you need a new coat of paint on your house or your business recently experienced flooding, ServiceMaster Recovery Specialists can help. We are Bend’s trusted restoration and reconstruction service – call today!